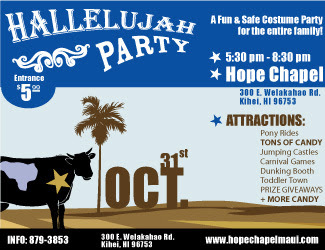 Hope Chapel will be throwing their annual Hallelujah Party for kids on October 31st from 5:30-8:30pm. Admission is $5 per person and includes candy, prizes and entrance to all of The Hallelujah Party attractions. One of the largest Halloween events for children on Maui, the Hallelujah Party has drawn hundreds of kids and their families for years, providing a fun and safe environment for young trick-or-treaters. With carnival style games, rock climbing walls, jumping castles, a dunking booth, pony rides, box car races and much more, there is something for every age of child at the Hallelujah Party. For the last three years, a special section, Toddler Town, has been added for younger kids with games geared specifically for their age group. For those looking to make it a full night out, there will be concessions available with plate lunches, pizza, salads, cotton candy, and shaved ice. The Hallelujah Party runs from 5:30-8:30 at Hope Chapel, located at 300 E. Welakahao Rd. in Kihei. For more information on the Hallelujah Party, contact Hope Chapel at 879-3853.